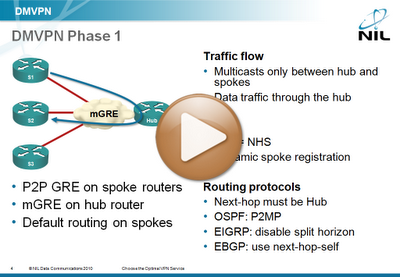 Phase 1 DMVPN uses point-to-point GRE tunnel on spoke routers and multipoint GRE tunnel on the hub router. All the DMVPN traffic (including the traffic between the spokes) flows through the hub router. On the spoke routers, the hub router must be the IP next-hop for all destinations reachable through the DMVPN subnet (including other spokes). Great video Ivan, thank you!